The fourth plinth in Trafalgar Square is one of the highest profile pieces of public artwork in the UK. The current resident is The Invisible Enemy Should Not Exist by Michael Rakowitz. Made from more than 10,000 empty Iraqi date syrup cans, the installation is a reconstruction of Lamassu, a 700BC winged deity that guarded the entrance to the Nergal Gate of Nineveh, until it was destroyed by terrorist organisation Daesh in 2015. The protective sculpture is brought back to life in Trafalgar Square as a homage to a centuries-old food manufacturing industry, now decimated by war. 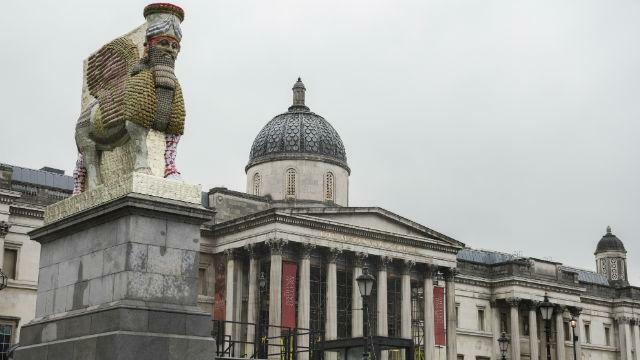 Is The Fourth Plinth your business?